At the age of 16 Harry Webb was given a guitar by his father. Harry then formed a vocal group called the Quintones. Webb was interested in skiffle music, a type of jug band music, popularized by “The King of Skiffle,” Scottish singer Lonnie Donegan who had an international hit in 1955 called “Rock Island Line”. In 1958 Webb became the lead singer of a British rock group named the Drifters. 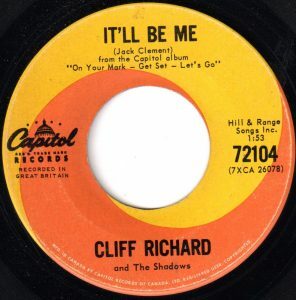 It was during this time that Harry Greatorex, who was promoting the band, gave Harry Webb the stage name, Cliff Richard. As rock and roll made some people think of rocks, Greatorex reasoned that “Cliff” would be a rock solid name for the young 18 year old Harry Webb. Cliff Richard would go on to record nearly 150 singles that made it onto the UK charts. 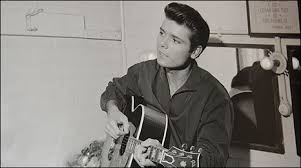 From March 1963 to May 1966 Cliff Richard had 15 hit singles in the Top 20 on CFUN. Of these 12 made the Top Ten and three peaked at #1. In 1963 Richard won the Best UK Male Singer in the NME (New Musical Express) Reader Poll. Richard’s follow up hit to “Summer Holiday” was “It’ll Be Me”. “It’ll Be Me” was first recorded by Jerry Lee Lewis in 1957. The song was penned by Jack Clement, a producer at Sun Records. Clement also wrote “Ballad Of A Teenage Queen”, “Guess Things Happen That Way” and “Ring Of Fire”. All were hits for Johnny Cash. Other recording artists who recorded songs by Clement include Roy Orbison, Ricky Nelson, Hank Snow, Jim Reeves, George Jones, Bobby Bare, Gerry & The Pacemakers, Ray Charles, Sue Thompson, Burl Ives, Trini Lopez, Charley Pride, Tom Jones and Ivory Joe Hunter. Clement discovered Jerry Lee Lewis and recorded sessions with Elvis Presley, Johnny Cash and Carl Perkins. “It’ll Be Me” is a curious song about a guy’s effort to search for his true love. He wants to show up in his lover’s life. It is not as though she is lost and he needs to find her. He isn’t contacting the police to report a missing person. Instead, he is trying to get his “amor” to notice him. He does this in some ambitious ways: he curls up in a sugar bowl, jumps on a rocket to Mars, hops on a shooting star, gets on a fishing hook so he’ll be noticed when his love interest casts the fishing rod into the water. He gets his face published in a comic book his sweetie likes to read, knocks on their door and crawls across the floor. He even shows up in a haystack. Aside from the poetic imagery and the lengths this guy goes to get noticed, would you want someone to be doing all these things? For some it could prove the guy loves you. For others the sum total of all these behaviors could just be obnoxious. In the UK Cliff Richard had 26 of his first 28 singles, from 1958 reach the Top Ten, which included a record of 23 Top Ten singles in a row, ending in the middle of 1965. Of these 15 singles were non-album singles. It would seem with the coming of the British Invasion that Cliff Richard would be discovered by the American record-buying public. However, it was not to be. He remained almost completely off the radar in the USA until his Top Ten hit in 1976 on the Billboard Hot 100 called “Devil Woman”. In the 1980’s he scored again with “We Don’t Talk Anymore” and “Dreamin’”. Cliff Richard was among the performers at the Diamond Jubilee concert held outside Buckingham Palace in June 2012. Then, on June 30, 2012, he helped to carry the Olympic torch from Derby to Birmingham as part of the torch relay for the 2012 Summer Olympics in London. Cliff Richard has also been active as a philanthropist. In October 2015 he went on tour at the age of 75. Over the course of his recording career, Cliff Richard has had 68 singles reach the Top Ten on the UK singles chart between 1958 and 2008.